How did you find yourself in this niche of the industry? I actually didn’t start cooking professionally until I was about 27 years old. Before that I was working in sales. I made a big career change in my life. I decided I wanted to follow something I was passionate about. I was always into cooking as a hobby and decided I wanted to do it professionally. 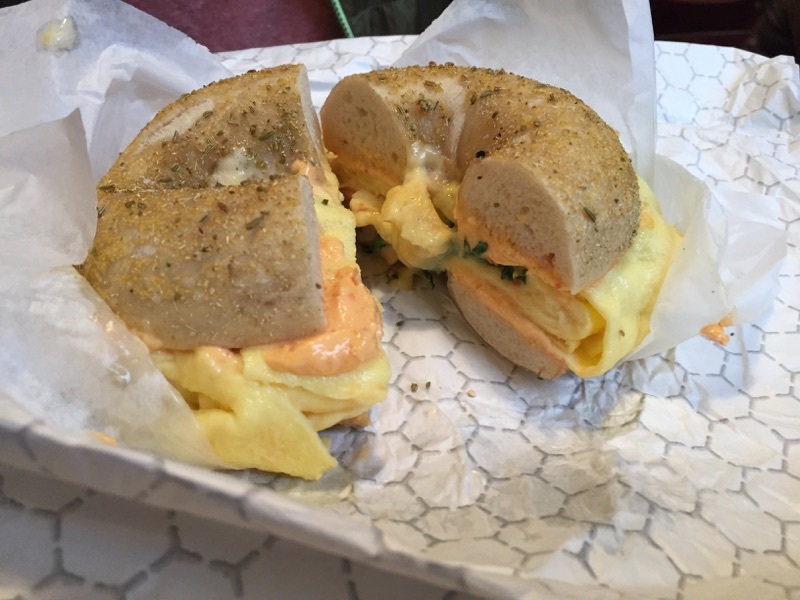 This Knead Bagels concept evolved from planning out the brunch menus when I was the chef at Matyson. I started out by looking at “What do I want to eat?” I’ve always been a huge bagel fan. 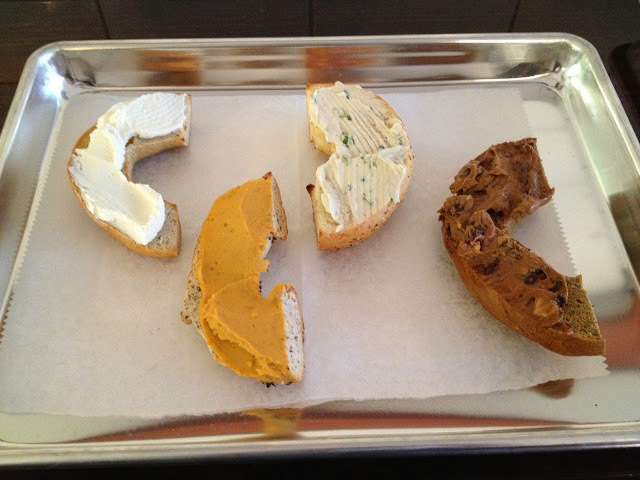 To me, bagels are the ultimate comfort food So I decided to try making bagels and was really excited about the results I was getting and really started playing with a lot of different flavor combinations. I feel like the bagel and spread is a very underutilized vehicle for carrying flavor. 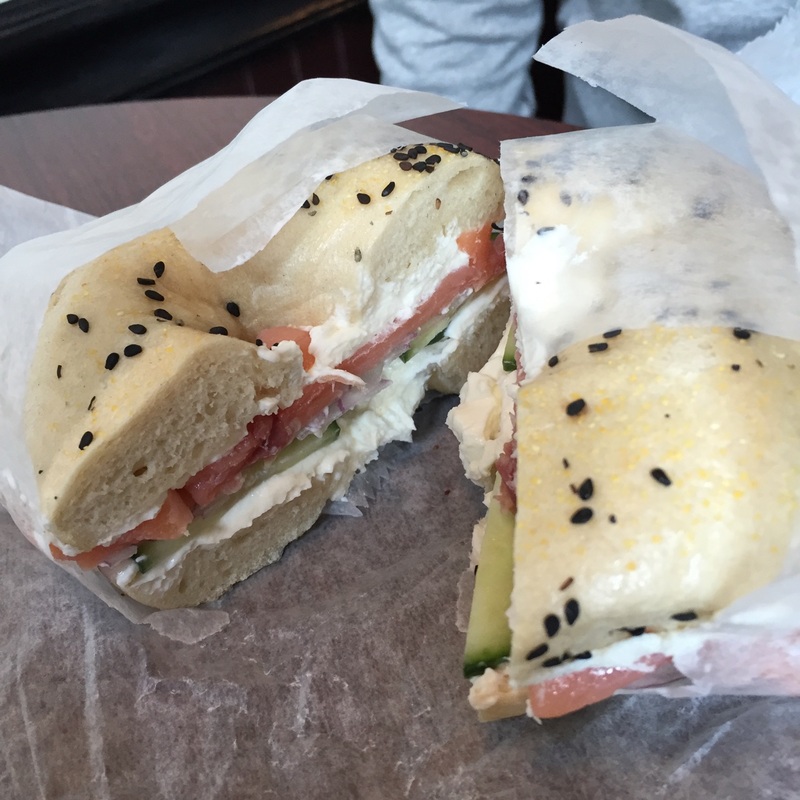 You go into most bagel shops, and it’s the same old everywhere. We’re trying to flip that over. For brunches at Matyson, we were doing a special bagel each week with a dedicated spread, and then that started to gain some traction. And we felt like we had something, once we got an arsenal of different flavors that were a little out of the ordinary. That came together right around the same time that Cheri and I found out we were having a baby. So we decided we wanted to get out of working nights, and the stars worked out perfectly to move into this. Do you consider yourself more of a chef or a baker? I’m a chef. Absolutely. There is a huge divide in the traditional kitchen model between the pastry side of things and the hot cooking side of things. Obviously I come from the hot cooking side of things, but I’m approaching bagels from a chef’s perspective, which is really what moved all of this forward. As a chef that’s used to doing new American creative cuisine, tasting menus and highly seasonal menus that are constantly evolving, I asked myself, “What happens if you plop me down right in the middle of a bagel shop?” This is the result here at Knead Bagels. The thing I always remember the most is my mom was always very creative and very good at using what was on hand. I really learned how to cook from my mom growing up. It was like, “Okay, we have this, this and this in the fridge. So we can turn it into this.” And that was really how I learned how to think about food. And then there was a point growing up where my mom was unable to cook on a lot of nights and it was up to me. So I took that same approach to use what was on hand and make it tasty. One of the things that my mom used to make a lot, which got me into pasta-making, was cavatelli and broccoli. It was just a simple dish. She would buy frozen cavatelli and sauté a bunch of broccoli, garlic and olive oil with Parmesan. It was one of those things that she made really well. One of the things I love about Italian food is that it’s deceptively simple, but when it’s done right, it’s really awesome. And that was something that my mom made all of the time. That was something that really stands out in my head. Something that was significant in my thinking of my food. I don’t remember being really picky, but apparently I was pretty picky when I was really young. I used to insist that my mom cut the crusts off my sandwiches. And I wouldn’t eat whole pieces of celery because of the stringiness. There’s foods now that I love that I never would have eaten as a child, like foie gras, sweet breads and liver. Things now that I’ve grown to really love as a chef when they’re prepared properly are things that I never would have dreamt about eating as a kid. I know some kids live on SpaghettiOs, and that’s stuff that I wouldn’t really go near now. My mom was always really big on using fresh ingredients and not doing a lot of canned frozen stuff. But there still is a soft spot in my heart for Mama Celesete. I do occasionally indulge in a Celesete microwaved pizza. Any childhood cooking accidents in the kitchen? Any as an adult in the kitchen/distillery? I definitely set off a few smoke alarms and burned some stuff as a kid. Probably the last major incident I had was at Matyson. It was the Friday night before Memorial Day, and I had a pan of fish in the oven. I went to pull it out, and I had a little too much oil in the pan. And you can actually still see I have a nice scar here from the oil hitting my arm. Growing up, did you enjoy eating outside anywhere in particular? How about now as an adult? Now as an adult, I love outdoor seating when the weather is nice. That’s always something I look forward to in the warmer months. As a kid, probably the first memory that comes to mind is: My dad’s side of the family has a house on a lake in upstate New York, about an hour-and-a-half north of New York City. And we would spend a lot of time up there. A lot of barbeques. I always remember eating hot dogs and hamburgers out there. Probably the biggest trend that I like both as a chef and as a diner is: the move towards more casual dining and casual concepts. You know, you see a place like Cheu Noodle Bar (Philadelphia), where you have an extremely talented chef in Ben Puchowitz selling very reasonably priced food that is absolutely delicious. Certainly that was one of the things that inspired me to make this move from fine dining into basically a quick-serve concept. I think that’s really where the future of dining is at. People our age are often dining out more and more. I feel like the trends are getting more and more adventurous and also more accessible at the same time from a price point perspective. For me, that’s the biggest thing that I’m excited about in food right now. And one of the biggest trends that I like. 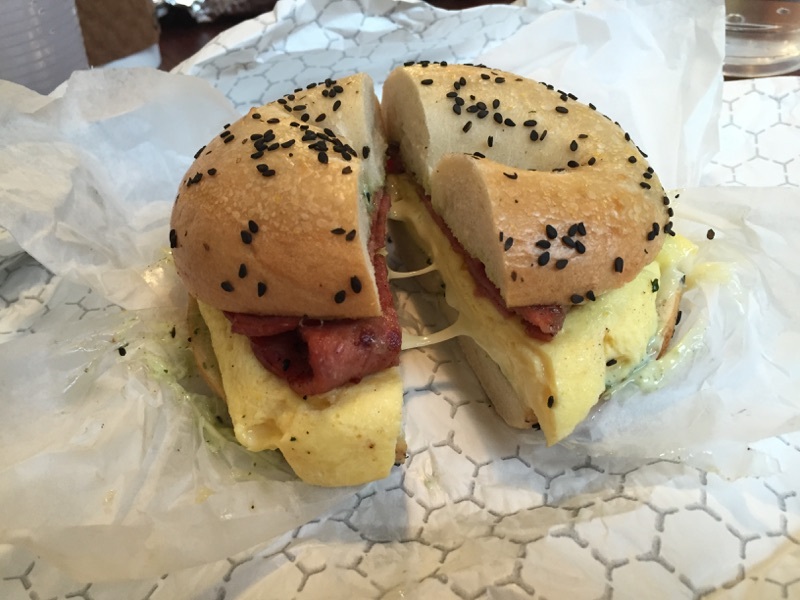 What do you think of big industry bagels (like Manhattan Bagels and Dunkin’ Donuts)? Would you eat them? Why/why not? I think a lot of them lack a depth of flavor. There’s a lot of shortcuts taken when things are mass-produced. Even a good bagel when frozen is still going to end up being a frozen bagel, and it’s going to lose a lot. To me, nothing beats a fresh bagel that’s only a couple hours out of the oven. And that’s why we bake in small batches throughout the day. If I was starving to death and big industry bagels were right in front of me, I would eat them. And I have eaten all of that stuff in the past. When working nights, I used to go to Lucky 13 Pub a lot right around the corner from my house. And when walking home, there was a Dunkin Donuts that was open 24 hours. And I definitely have indulged in a few late-night Dunkin’ Donuts visits – “everything bagel with cream cheese, add bacon.” Those bagels that Dunkin Donuts bakes are what they are. They are a mass-produced product. I’m not exactly sure how they go about producing them, but my guess is that they are frozen when they come in and they probably bake them off on site there, which a lot of bagel places do. There are all sorts of companies out there that sell frozen dough. Obviously, that’s not something we do here. We do everything from scratch. 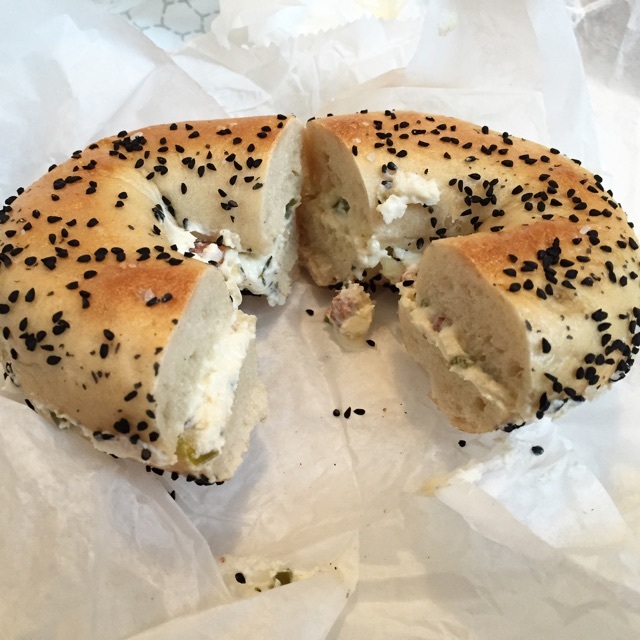 What are your thoughts on New York bagels being the “almighty” bagels? 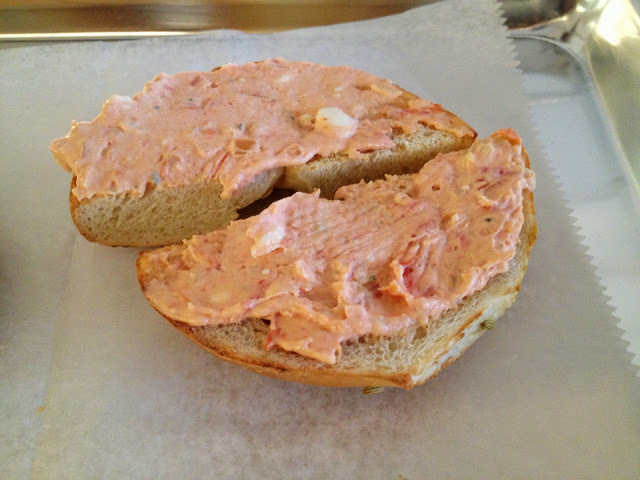 Did/do you set out to make a “New York” bagel? Why/why not? As far as the New York bagel thing goes, there are a lot of great bagels in New York, there are a lot of great bagels in Montreal, and there are a lot of great bagels in many places in between. New Yorkers will argue that their public water system is what makes their bagels so good, and people in Montreal will argue that their wood fired ovens make their bagels supreme. But I feel that what makes a great bagel is treating the process (whichever you use) with respect and making sure that your dough is cold fermented for about a day. 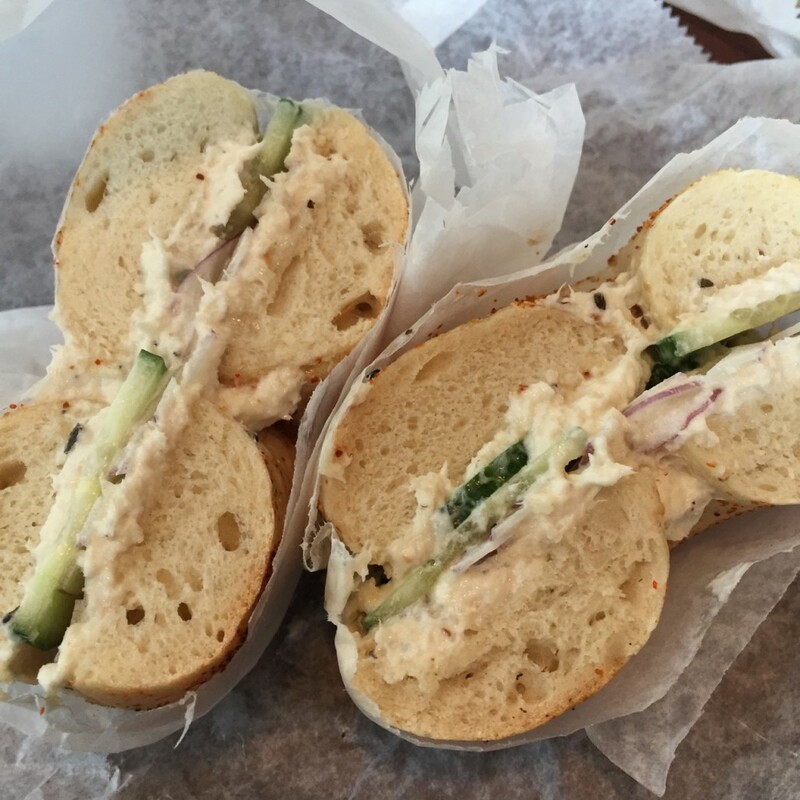 Our bagels are neither authentic New York- nor Montreal-style. I cook them New York-style — kettle boiled, then cooked in a gas-powered, revolving-deck oven — but my dough is a bit of a hybrid of both styles, leaning more toward New York. 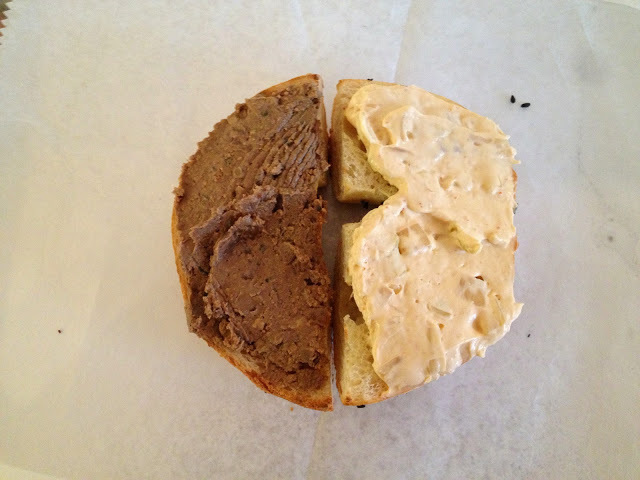 Traditional New York bagels contain malt, while traditional Montreal bagels contain honey (and are also poached in water sweetened with honey). My dough uses more traditional New York-style ratios with the substitution of honey for the traditional malt. Even though honey is more expensive than malt, the end result is well worth it. What family recipe do you want to share with us? This is a recipe for my great grandmother LuLu’s latkes. It’s something that she always made for many of the Jewish holidays. This recipe has been passed down. My aunt still makes them sometimes. I make them now. I have certainly used it as a base for other things, but I always like going back to the classic latke. Enjoy my great grandmother LuLu’s latkes! 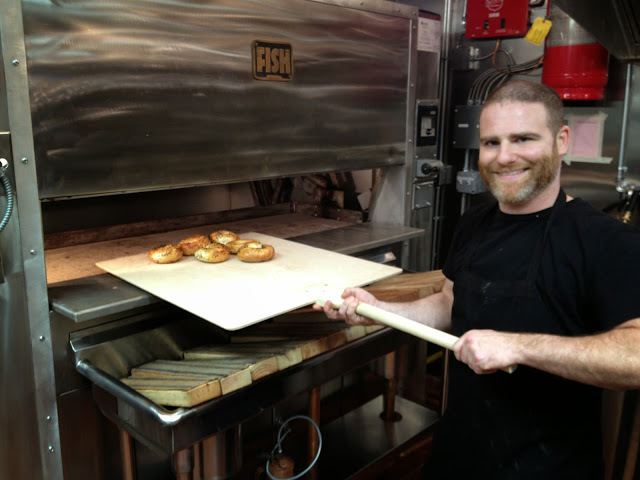 Adam Willner is the owner/chef of Knead Bagels. Adam began his professional cooking career at Stephen Starr’s Jones and the Continental in Philadelphia. Then he was at Matyson — one of Philly’s finest BYOB’s — for a long time, where he worked his way up to sous chef. He left to cook at Sidecar Bar & Grille for a while and then returned to takeover as head chef at Matyson when chef Ben Puchowitz was opening up Cheu Noodle Bar. On this second stint, Adam and wife Cheri — who met while both working at Matyson — were tasked with starting up brunches, where Adam began experimenting with baking his own bagels. 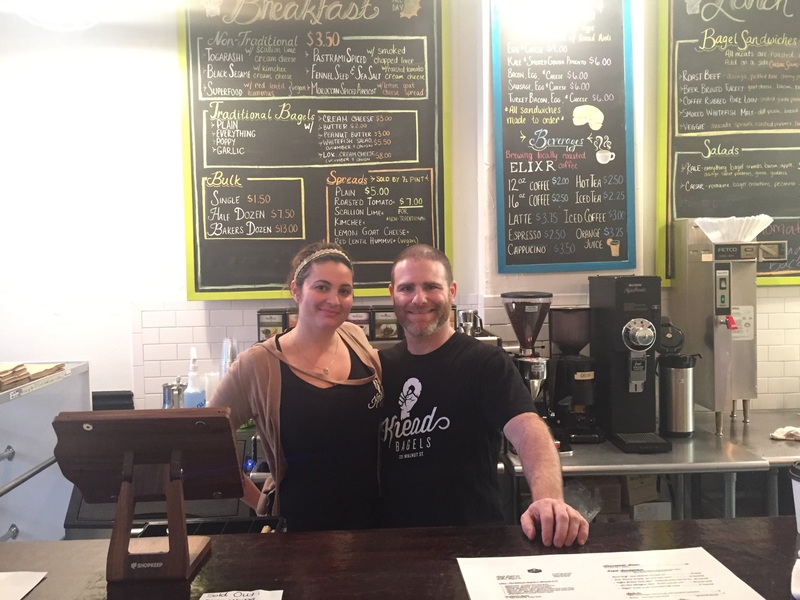 Now Cheri and Adam recently opened Knead Bagels, where they bake small batch bagels and homemade spreads, offering traditional and nontraditional flavors, bagel sandwiches, soups and more. 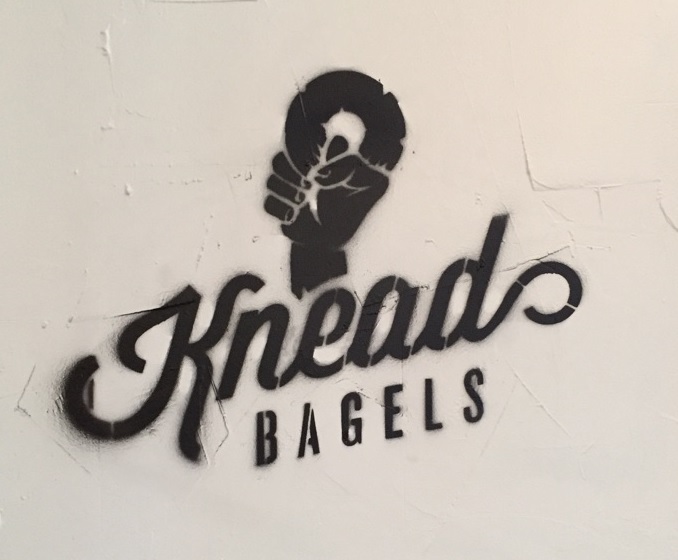 For more on Knead Bagels, follow them on Facebook, Twitter and Instagram.